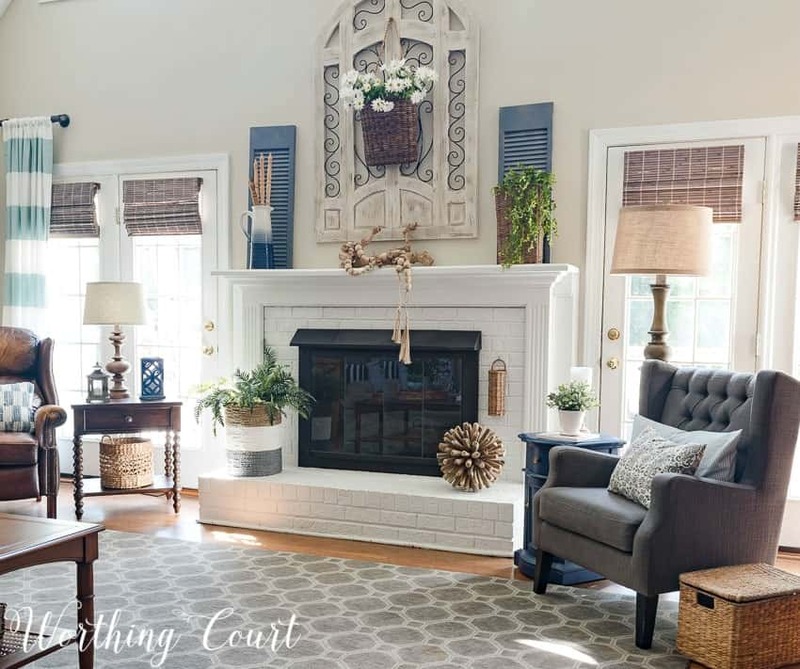 When decorating my family room for the summer months, I was on a mission to keep the fireplace decor simple. Hopefully, I’ve managed to pull that off by using a few simple, natural and organic elements. With the arrival of summer and the temps and humidity on the rise, I want the decor inside my home to stay on the simple side. I want my home to feel light, fresh and welcoming, so no heavy or bulky decorations for me this time of year. 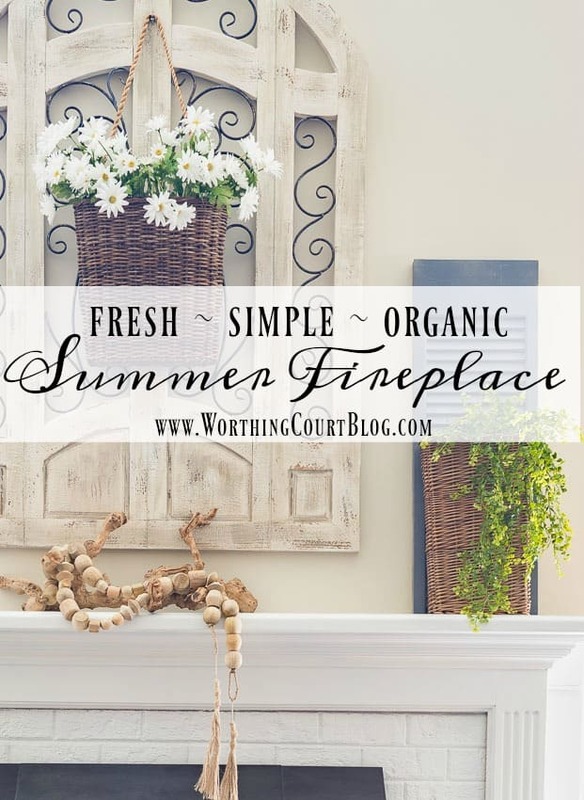 I added a small amount of blue and green, to tie in with the summer decor in my dining room and breakfast nook, but I mainly focused on organic elements for my summer fireplace. A hanging basket, overflowing with daisies, is a sure sign that summer has arrived at Worthing Court! A crockery vase is filled with unexpected spindles, instead of stick filler of some kind. 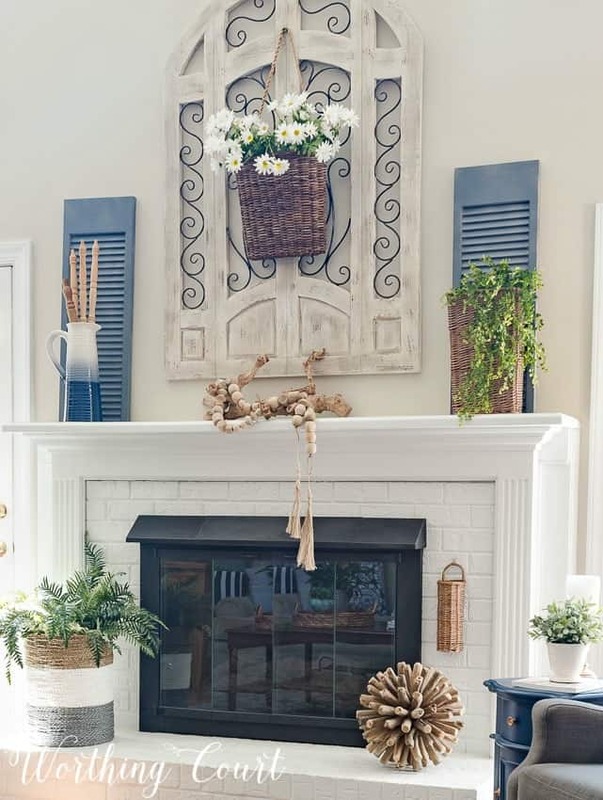 A flat basket filled with draping greenery vine and a grapewood branch dressed with wooden beads and jute tassels fills out the rest of the mantel. Down on the hearth, I’ve continued the simple and organic theme by using a basket to contain a large fern and my spikey wood orb. A tiny wall basket, attached to the brick with a removable hook helps to fill a spot that looked a little too empty. This is just a little peek at one side of my summer family room. I hope you’ll come back on Monday for the full summer tour of my home! Love the pitcher on the mantle with the (?) spindles! Really loving your simple but elegant mantles. So peaceful and inspiring! Love the touches of blue. That pitcher with the spindles is gorgeous! I will be waiting for the full tour. Love your home. Thanks for sharing. Enjoy this super Saturday. Love the crockery vase and the touches of blue. Your mantle looks ready for summer. Looks great! I like the three pictures by the cabinet, behind the gray chair – don’t recall seeing those before. So lovely and relaxing! Can’t wait to see the full tour. I love the basket of daises over your fireplace. Perfect! Clean, crisp, and welcoming! I love it! So sweet and simple. I love the daisies! I love the spindles and the blue pitcher! Simple is something I have never been able to do…for anything. I drive ME crazy! So pretty! I wish I had a fireplace. Simple and oh so pretty!! Hi Julie. No, I didn’t make the beaded garland. I just walked into Target a couple of weeks ago and there it was! It was in a display with several of their new items for spring/summer. Love your idea for the door basket! 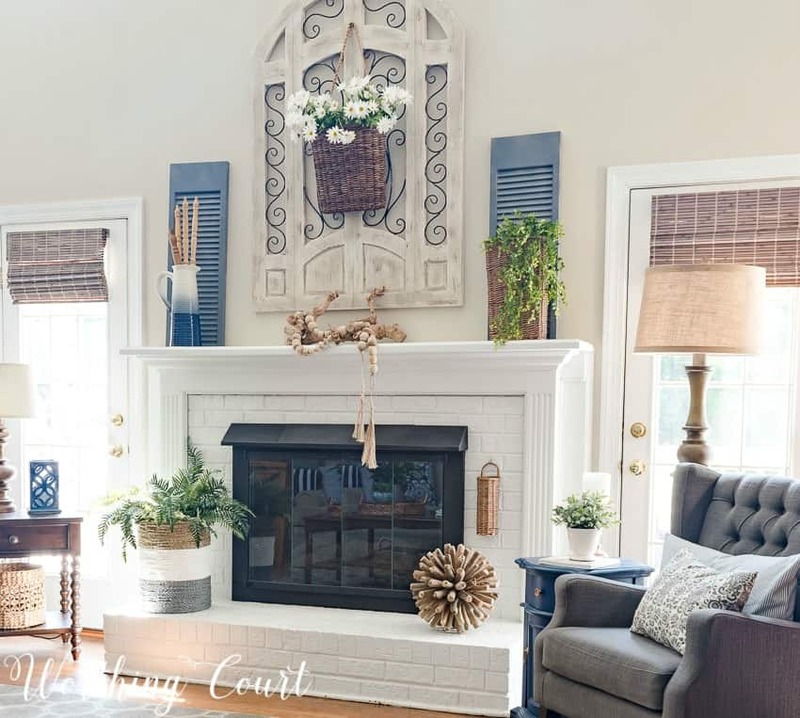 The moment I saw the basket with daisies, I knew my fireplace décor needed the same thing! We usually have an antique mirror over the mantle, but the basket is so light and fresh…going to add this tomorrow! Thanks! So beautiful!! I love the ideas you shared. Could you tell me where you found the large wood and metal piece on your mantel? So simple and so elegant! I really like this a lot. It’s just beautiful! What a beautiful home! Love the fireplace, so pretty. Sharing on FB. Thank you for sharing on Merry Monday! Have a great week! Such pretty updates for summer! I love the over-sized wooden beads with tassels. So pretty! I really want to paint my fireplace. Love the ideas. Thanks for sharing at the #InspirationSpotlight party @DearCreatives Pinned & shared. 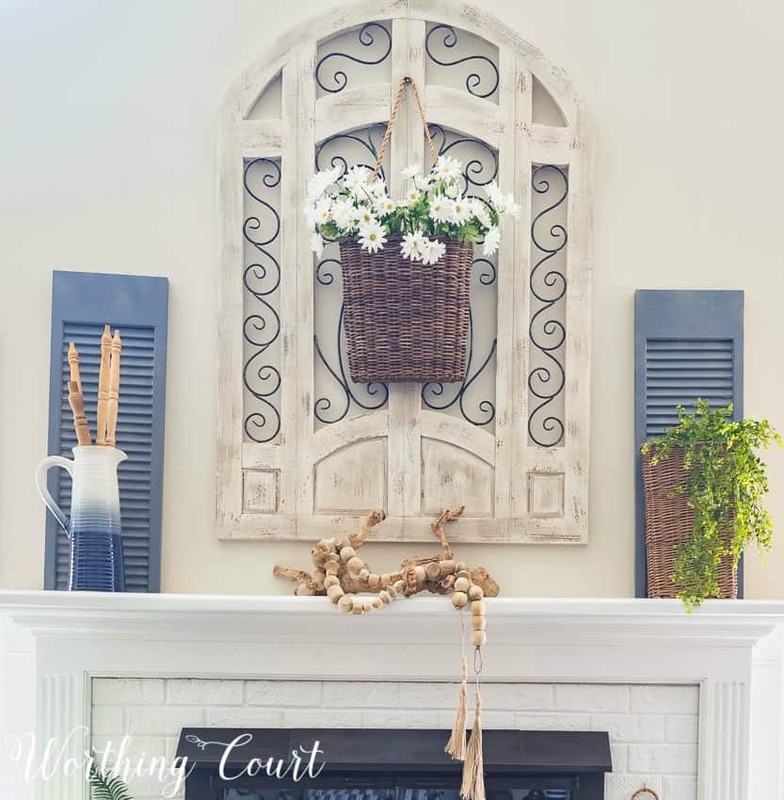 Love the hanging wicker basket with daisies! Also I’ll be checking target to see if they still have any bead garland still in stock. Great look! Love it all. Would like to know the paint color. Hi Linda. 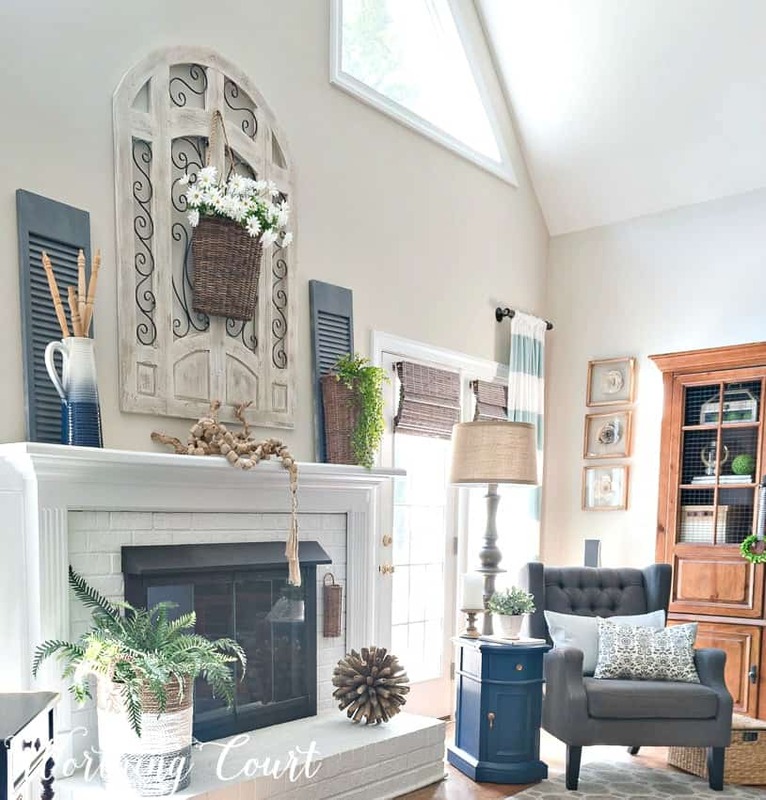 The wall color is Sherwin Williams Accessible Beige and the paint used on the fireplace is Sherwin Williams Extra White. Where did you find the hanging basket? It’s an awesome decorative piece thats so versatile!